Spinach is a hardy cool weather crop, ideal for an early New England market. Temperature for optimum production and high quality is 55°F to 60°F with day length of approximately 12 hours. Seed will germinate at soil temperatures of 32°F to 60°F and the young plants can withstand temperatures as low as 15°F to 20°F. Under the hot temperatures and long days of summer, spinach will bolt (develop a seed stalk and go to seed), which makes it unmarketable. The tendency to bolt varies with the cultivar, some being more resistant than others. Spinach is grown for use as a cooked green vegetable or for greens in a salad. Growers who want greens for the market in the summer should consider beet greens and/or Swiss chard as substitutes. They produce well under high temperature and long day conditions. There are two main types of spinach: smooth leaf and savoy (crinkled leaf). Both grow equally well and are marketed the same, but the savoy type, because of its crinkled leaf, is more difficult to clean. 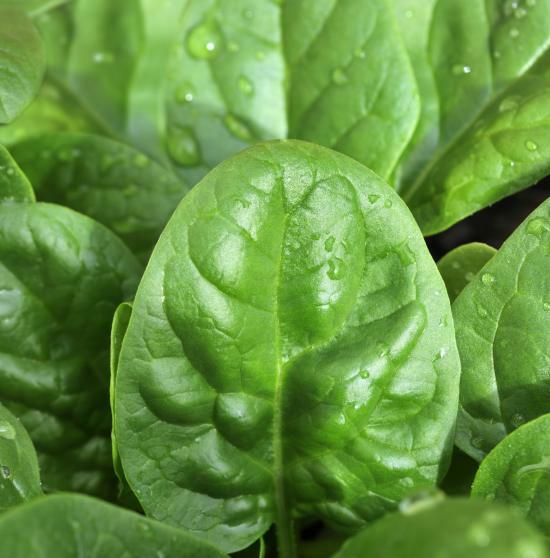 Spinach can be seeded in the spring as soon as the soil can be worked. Sandy soils are generally preferred because they drain early and warm a little quicker. Two main crops are generally grown, one in the spring, another in late summer, seeded about six weeks before the average first frost. Growers in New England are having some success with overwintering spinach. A floating row cover can be used for protection. For overwintering spinach, particularly in northern areas, an early September seeding date is suggested. Survival of the early crop has been satisfactory following a mild winter with good snow cover. Normally, plan on 40 to 50 days to harvest under good growing conditions, with 60 to 70 days for very early plantings. Good yields for fresh market will range from 5 to 7 tons/A and 10 to 12 tons/A for processing. Market spinach is usually washed before marketing, and if cut early in the day and iced, can have a storage life of 10 to 14 days. The most common containers are bushel baskets, tubs or crates, each holding 18 to 25 lb.